Vietnam’s Tourism Industry – Should it be left to the kids? The full un-diluted version of Vietnam blog is on its way too! “Start in Hanoi, then work your way to Saigon. You’ll see a difference in the south” – A simple piece of advice given to me before becoming a tourist of this country. “Pay – You pay!” Insisting the toll booth we went through cost over ten times more than it did. He became visibly angry – raised his voice. The English he’d been chatting to me with had all been ‘forgotten’ and he became more animated in his demand. Now, I’m aware he must see hundreds of tourists a week – and, sadly, I have no doubt he thought by shouting i’d give in and pay. What took me by surprise was – this tact became a frequent occurrence – when dealing with anyone in trade. Employee’s of the tourism industry seem to have been given this handbook on dealing with us tourists. When ‘pointing’ and ‘one-syllable-directions’ fail – try raising your voice. If the offender still isn’t doing what you expect – become more aggressive with your gestures. Be as defensive as possible when challenged on any of your demands and Remember – when in doubt, just refuse to speak English. 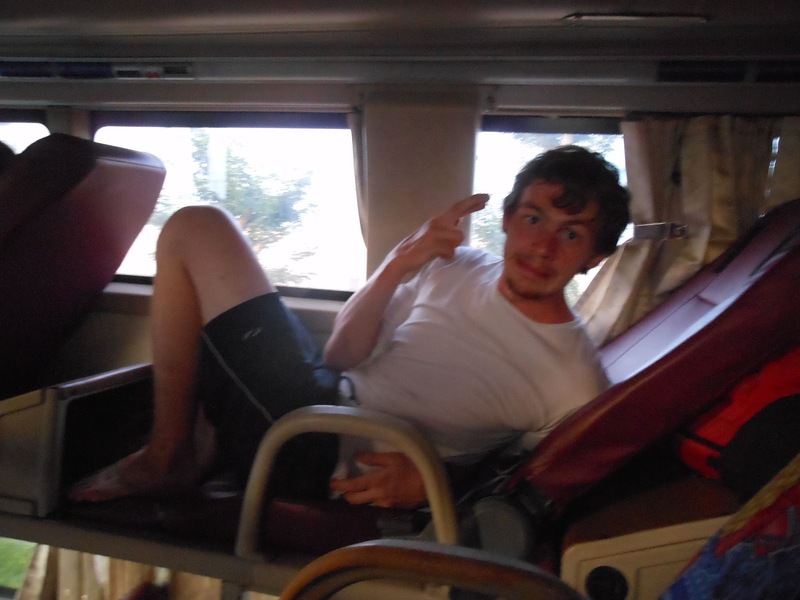 In total, I rode five 12 hour ‘sleeper’ buses, and what I noticed was rather shocking. No matter when you got on, or where, it was a case of western people are at the back – natives are at the front. When sitting in a seat deemed ‘wrong’ (i.e too far forward) a staff member would repeat the steps from the guidebook I mentioned above. Once and only once did i attempt a Rosa-Parks-esque stand-off. Refusing to move to the back of the bus. He became furious and told me to get off. I’m sure there are many reasons why in these particular cases – its just-so-happened – to be this way. But surely better people-skills are required. Surely better training could be given. Surely no-one deserves a verbal onslaught from an angry bus driver. Funny, i thought, that in every other aspect Vietnam had proven to be exceptional. Hotel workers were some of the best i’d encountered. Street sellers were polite and easy-going. Restaurant staff were as good as the food (which in Vietnam is very good indeed!). Why then had the travel trade been left so far behind? Are us tourists really that bad? I needed to know, and strangely an answer came to me from an unlikely source. Saigon’s Parks are a breath of fresh air. You can see people learning to dance, outdoor martial artists giving lessons, dozens of children skating and students. Students of english – this generation of academics gave me hope for Vietnam’s tourism industry. What seems like the whole school – are out in the parks simply going up and talking to people. they are practising english. The advice i got about ‘people changing’ as i travel through Vietnam – was true. I saw an attitude change. I saw a generation change but mostly I saw a thirst for knowledge – and a spark of passion in young people that I fail to see back in England. So if you ask me ‘what do you think of tourism in Vietnam?’ I’d say go, dive in and get to know the people behind the job description. But be wary of Airport taxis! Next post‘Writing Off the Page’ – How to use writing as a means to travel the world.